Sir.—We read with great interest the article entitled "Multicystic Ovaries Detected by Sonography in Children with Hypothyroidism," by Linsay et al (Journal 1980;134:588-592). 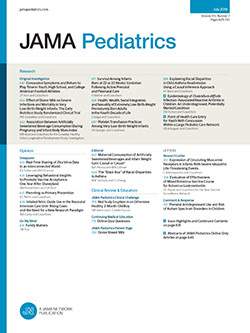 We recently described the case of a 34-month-old girl with congenital hypothyroidism who exhibited precocious puberty manifested by breast development with secretion of a whitish fluid, recurrent vaginal bleeding, and an associated myopathy (Kocher-Debré-Semelaigne syndrome). With the aid of pelvic sonography, we detected ovarian cysts. The association of congenital hypothyroidism, myopathy, and precocious puberty has not been described before, to our knowledge; only that of congenital hypothyroidism and precocious puberty.1 We recently wrote an article on this subject, entitled "Pubertad Precoz y miopatia en el Hipotiroidismo Congénito" ("Myopathy and Precocious Puberty With Congenital Hypothyroidism"),2 for the new journal Acta Pediátrica de México, which is not yet included in the Index Medicus.